How is the country gearing up for the opening of the New Third Airport? Some call it a city within a city, which should give some idea of the intense hype surrounding Istanbul New Third Airport. With phase one, set to open in October 2018, it is without a doubt, one of the world’s most ambitious man-made structures. When fully operational, it will handle 144 planes at any given time and employ more than 200,000 people. Spearheading the “mega-projects” of Turkey, when finally, complete ten years later, it will be a major hub of business and leisure travel, as well as exports and imports through its flights to 350 destinations around the globe. On a 1 to 10 scale of ambition, Turkey is reaching 15 on this one and has called it their prestigious trademark project. It will highlight Turkey’s dream of becoming a global player and regional influencer and contribute significantly to the economy and employment. Ranking as one of the largest air travel hubs in the world, and with the capacity to handle up to 250 million passengers a year, how is the country gearing up for its opening? Istanbul New Third Airport will replace Ataturk, that is Turkey’s busiest regarding domestic and international travel. Despite its roaring success, air traffic is growing every year, and there is no room for Ataturk airport to expand. Desperate modernisation needs also contribute towards its closure. However, operations will slowly halt instead of ceasing straight away. Flights will transfer to the new hub straight away, but until it is up and running with all kinks ironed out, maintenance and repairs will take place at Ataturk. Reports also said cargo companies will still use it, but companies like UPS, FedEx and DHL are already securing their spots at the new airport. 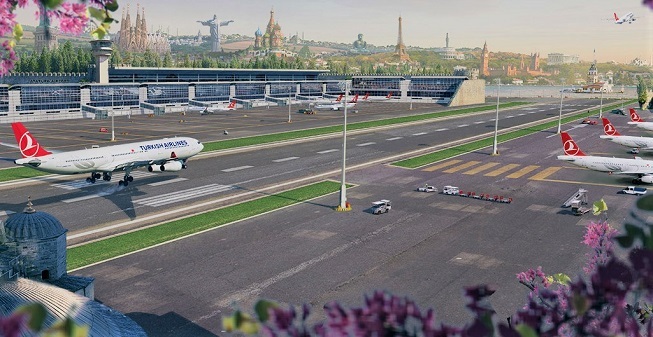 Eventually, once officials have successfully transferred all operations over, Ataturk airport will become the “people’s garden.” Work on the large green space intended for relaxation and rest will begin, in October and for a considerable time, it will be a work in progress. The park is just one of many intended green space for Istanbul. The new airport offers excellent opportunities for Turkish Airlines to expand their network. The airline that wants to become the leading European carrier with global coverage intends to target Indian, China, South America and Canada and are currently in talks with many banks to secure up to 1 billion USD loans to construct its base at the new hub. Many aviation experts say Turkish Airlines is the symbolic face of aviation in the country and in recent years, it has increased its global recognition, so understandably, they too want to expand in line with the new airport. If they can successfully use the new hub to tap into the growing air travel markets of Indian and China, the result will undoubtedly have a positive effect on Turkish tourism. In the meantime, it will be go-go-go, on October the 29th as the airline uses 300 trucks to transfer all equipment within a staggering tight timeframe of just 18 hours. Such is the intense interest of Turkish airlines in using this opportunity, they are in partnership with a leading construction company to build a residential city nearby. With renewable energy and recycling technology, employees will live there, while, the hotel district will accommodate workers for other airlines. Has the Real Estate Market Been Affected? While all attention has been on the airport and Turkish Airlines, many global real estate investors have focused their interest on the surrounding real estate sector. As soon as Recep Tayyip Erdogan announced official plans for the new air hub, they started buying up surrounding land, forcing significant price increases. Another flurry of interest arose after the formal announcement of the Canal Istanbul project, also in European Istanbul. In a recent report by Forbes, land prices in areas surrounding both projects have increased by 40% over the last 8 years. In Arnavutkoy, a strategic area for both projects, per square meterage prices have risen by a staggering 60%, giving a lot of return on investment to early buyers. Without a doubt, the Istanbul New Third Airport has already changed the European side of the city, and the eyes of the world will be watching on its grand opening day in October. Investing in the Istanbul Real Estate Market: Istanbul is the number one destination for foreign property buyers, and in this article, we look at five reasons why global investors are choosing to add the city to their property portfolios.